Why Are The Springs So Important? Without the springs of your garage door, it won’t be going anywhere! Garage doors are much heavier than they look, and the strength needed to lift them up comes from the springs. They create and store energy that’s used to be able to pull your door up off the ground when you have places to be. If you notice your door struggling to open, and falling closed more than it lowers, the issue is likely with the springs. Attempting to DIY it is too dangerous, as the springs can snap and harm you. They also hold the weight of the door, and it might completely fall down and cause a bigger issue. That’s why it’s best to leave it to the experts! There are two varieties of springs and the difference comes in how they generate the energy they need to lift the door. Extension springs are pulled apart and the tension from this creates the energy, while torsion springs twist up tightly. Extension springs wear out and break faster due to strain, and can cause damage when they snap and ricochet, so knowing which kind you have them is for the best! Whichever type of spring and whatever it may need, you can count on us to get it taken care of in a snap. Our team can adjust springs that may have shifted out of place over time, or replace any springs that have worn out or even broken entirely. We’ll do so carefully, but swiftly, so your door will be working again in no time. Our professionals can come out and get to work right away at a time that works best for your busy schedule! Just call Garage Door Repair Matthews today. There’s no clever or surprising answer here. If a spring breaks, you need to have it replaced. Preferably as soon as possible. Even if you can still open the door with one broken spring, doing so is liable to make things much worse by spreading the damage around due to the uneven lifting. 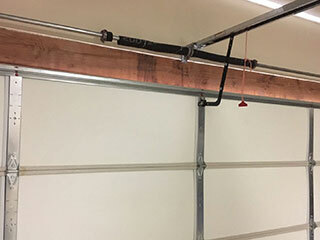 Don’t try to replace the springs yourself, either; this is one of the leading causes of garage door related injuries. Call a professional, and book them ASAP. Garage door springs range in quality, which is assessed in terms of the expected number of opening and closing cycles the spring can complete before breaking, assuming ideal conditions. The cheapest springs tend to offer about 10,000 cycles, while the most expensive offer 50,000. However, the “assuming ideal conditions” part is important. If your door isn’t well insulated or you don’t service your springs every six months or so, they won’t last nearly as long. How do I adjust garage door spring tension? Spring tension is adjusted using the winding cone attached to the spring’s housing. To use the winding cone, the door’s opener needs to be unplugged, the door locked in place, and the screws holding it in place must be loosened. After that, the spring’s tension can be adjusted. Keep in mind that garage door springs are dangerous; you probably shouldn’t attempt this on your own until you’ve had some practice under experienced supervision. Avoid adjusting the tension yourself unless you’ve had experience with this and are sure you know how to avoid making things worse or causing an accident; tightening your springs isn’t nearly as dangerous as replacing them, but it still shouldn’t be taken lightly. Simply avoid making excessive use of your garage door until you can have a professional come and adjust your springs and cables. Can I replace a broken garage door spring myself? No. To expand on that, while you technically can replace a broken spring on your own, it is very inadvisable to try unless you’ve had training. Many of the worst garage door accidents that involve serious property damage, injury, or death are a product of amateur spring replacement gone awry. The springs contain a large amount of kinetic energy, and you never know when a broken piece will still be ready to burst loose. If there’s any garage door maintenance task you shouldn’t attempt untrained, it’s this one.